To use the officeatwork 365 Template Chooser with files coming from your SharePoint online, your Office 365 tenant needs to be configured accordingly. This configuration can be done manually or by using the officeatwork 365 «Template Chooser Admin App». 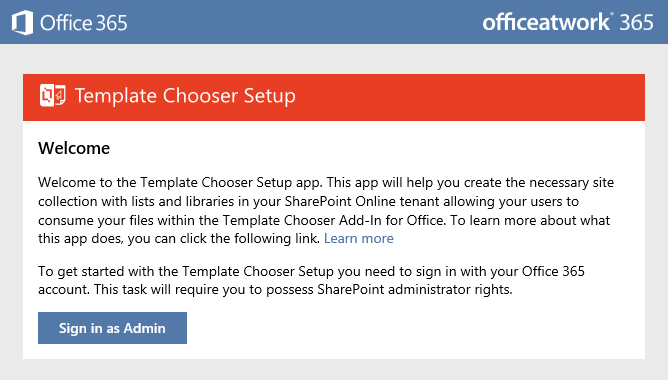 Please note: You need to be a SharePoint administrator AND an Office 365 administrator to run the Template Chooser Setup. The officeatwork 365 «Template Chooser Admin App» is a Office 365 Web App designed to help you setup and maintain your SharePoint Online configuration for the officeatwork 365 Template Chooser Office Add-in. The Web App will help you create (and maintain) a new SharePoint site collection named «officeatwork» and a subsite named «TemplateChooser». Within that subsite it will also create a list named «TemplateLibraries» and a document library named «Templates». The list and the document library will initially be populated with some sample data. Sign-in to the officeatwork 365 «Template Chooser Admin App» (This requires SharePoint Admin rights) using your corporate or school Office 365 account. Click on the «Create Repository» Button. After the repository is created return to Word and re-launch the Add-in. Give each entry a name by typing a name into the Title field of each entry. Define for each entry in what Office applications the library shall be visible. New entries will be visible in all Office applications by default. Re-load the officeatwork 365 Template Chooser Web Office Add-in in your Office application. Tip: Any document library within your SharePoint Online tenant can be used as a template library. There are no specific requirements other than that those listed libraries must be of type SharePoint document library. SharePoint Online is quite complex and therefor things can be configured in a way that will not allow you to see your libraries. When you get this message in the list of libraries it is most likely the case that you do not have access to the SharePoint list that holds the list of all SharePoint Document Libraries that should be shown as available libraries. Click on the link ‘SharePoint Online libraries list’ in the message. This will try to open the SharePoint list using your Browser. If you have not access to the list you should be seeing the default no access message form SharePoint. Contact your SharePoint administrator to ask for access to that list.